We have been keeping this one a little close to the chest, but now it’s time to announce it to the masses! Big Animals and World Class Critters on One Trip! We are very happy to introduce an exciting new trip for 2020. This special itinerary is a great new twist on the typical Komodo itinerary, we are hosting an exciting, customized Big Animals Expedition! On this trip we will be concentrating on encounters with whale sharks and manta rays. Of course, we will also find time to interact with a few Komodo Dragons! However, this doesn’t mean we will be ignoring what has made the region famous. In between encounters with these oceanic giants, we will be hitting the best critter spots as well. This journey is a one of a kind adventure with the largest variety of attractions in Indonesia. We are working with the management of the Samambaia to create a one of kind itinerary for this trip. Unlike most Komodo trips, which try to visit all of the best sites, we will be concentrating on sites with Big Animals and Critters. Whalesharks are high on everyone’s diving bucket list, so we will spend two days with these gentle giants. We never tire of diving with mantas, they are one of the most charismatic big animals in the ocean. Komodo has an amazing variety of sites which feature manta rays, but Manta Alley is the best. Our plan is to spend two mornings at this incredible site where trains of mantas often appear. However, it’s not only the big animals on our radar. The Komodo region is one of the most productive critter destinations in Indonesia. The Big Animals Expedition runs from 21 June to 2 July 2020. 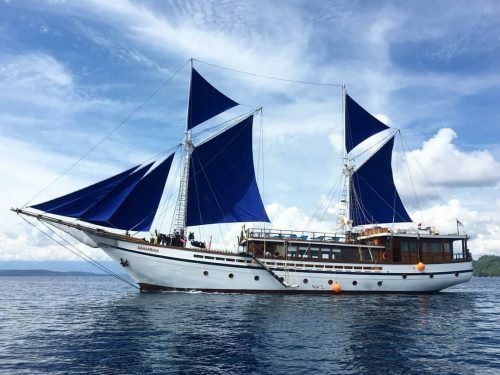 Our host for this exciting trip is the Samambaia Liveaboard, a traditionally designed Indonesian Phinisi. The trip will start in Bali on the 21st of June, therefore no domestic flights are needed. We will depart from south Bali near Sanur, therefore, no diving will happen on that day. We will be flying domestically on the 2nd of July, therefore, we recommend that international flights are planned for 3 July. The Samambaia is the perfect vessel for our Big Animals Expedition. She comfortably holds 14 passengers with 6 double/twin rooms and 1 Double Master cabin. A spacious camera room is a wonderful feature for underwater photographers on this trip. On days where there is no whaleshark activity planned we will do up to 4 dives per day. There are 6 standard cabins, priced at USD $5220 per person based on twin/double share. 2 cabins are double only, 2 are twin only, and 2 can be either twin or double.